A high level 18-member delegation arrived in Kabul for the first meeting of the Pakistan Afghanistan Joint Committee (PAJC) as part of a joint effort by Centre for Research and Security Studies, SaferWorld and Organisation for Economic Studies and Peace for Pak-Afghan track 1.5/II project Beyond Boundaries Phase III. The meeting was held in Kabul, Afghanistan from December 14 – 17, 2017. Being led by Mr. Rana Afzal Khan, Member of National Assembly – PML-N, and Parliamentary Secretary Finance, and chaired by FIRD Chairman Mr. Toaha Qureshi, MBE as an international neutral expert from the UK, the Pakistani origin delegation included: Ms. Shazia Marri, Member of National Assembly- PPP; Mr. Shibli Faraz, Senator- PTI, and Chairman Senate Standing Committee of Commerce; Mr. Murtaza Wahab, Senator- PPP; Dr. Shoaib Suddle, Former IG Police and Federal Tax Ombudsman; Lt. Gen. (R) Asif Yasin Malik, former Secretary Defense; Mr. Qazi Humayyun, former Ambassador; Mr. Mian Sanaullah, former Ambassador; Ms. Seema Ilahi Baloch, former Ambassador; Mr. Tahir Khan, senior journalist and Editor NNI, Mr. Rehman Azhar, senior journalist Express TV, and host of primetime TV talk show “Center Stage with Rehman Azhar”; Mr. Kashif Abbasi, senior journalist ARY News, and anchor of primetime TV Talk show “Off The Record”; Mr. Zahid Hussain, senior journalist and author of “Frontline Pakistan” and “The Struggle with Militant Islam”; Mr. Sarfraz Raja, senior journalist GEO News and senior correspondent International Affairs; Ms. Faiza, Secretary General Pakistan Afghanistan Joint Chamber of Commerce & Industry (PAJCCI); Mr. Imtiaz Gul, Executive Director, CRSS; Mr. Aized Ali, Project Director Beyond Boundaries, CRSS. The group’s counterpart, a high level 16-member Afghan PAJC delegation, was headed by Mr. Abdul Qader Zazai, Member and Secretary of Parliament. Other members of the group included: Mr. Mirwais Yasini, Member of Parliament and former Deputy Speaker; Mr. Khalid Pashtoon, Member of Parliament; Ms. Rangina Kargar, Member of Parliament; Ms. Elay Ershad, Member of Parliament; Mr. Salim Khan Kunduzi, Former Governor Nangarhar and former Deputy Minister of Agriculture; Mr. Asif Nang, former Governor Farah; Mr. Danish Karrokhil, senior journalist and Head of Pajhwok News; Ms. Najiba Ayoubi, senior journalist and Head of Kileed Group; Mr. M. Rafi Sidiqi, senior journalist and Head of Khurshid TV; Mr. Haji Younes Momand, Vice President Afghan Chamber of Commerce & Industry (ACCI); Mr. Abdul Qadeer Bahman, Head of International Chamber of Commerce (ICC); Mr. Naqibullah Safi, Secretary General PAJCCI; Ms. Meena Wardak, Director Trade and Investment ICC; Mr. Mozammil Shinwari, Advisor to CEO on Trade and Economics; and Ms. Asila Wardak, Diplomat having served for Afghanistan at UN and MoFA. The Pakistan PAJC group held a meeting and briefing with the serving Ambassador of Pakistan, Mr. Zahid Nasrullah Khan, at the Embassy of Pakistan (Kabul) on December 14. The briefing was followed by a working dinner hosted by the Ambassador for both Pakistan and Afghan PAJC groups. 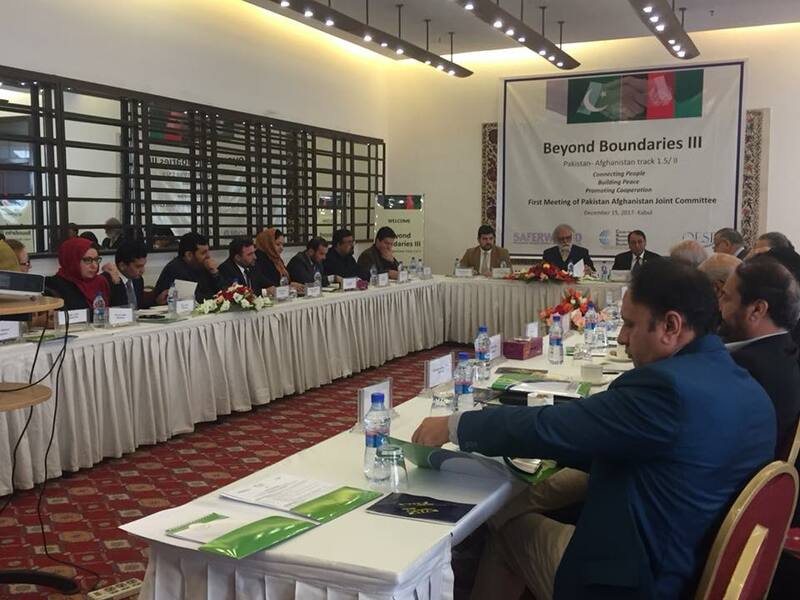 Both the PAJC groups held a one day workshop in Kabul on 15 November, at Serena Hotel. 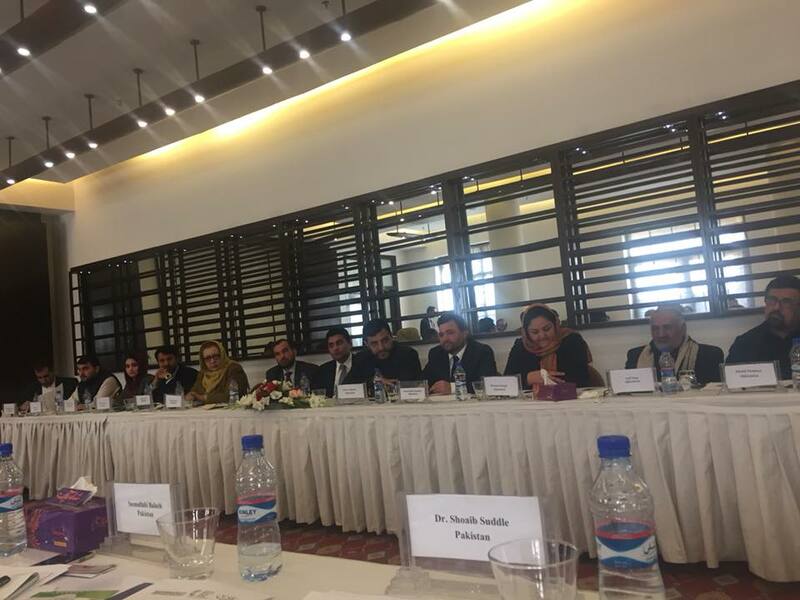 During the one day workshop, the PAJC held detailed discussion on the core issues affecting the Pak-Afghan bilateral relations and outlined ways and means to work together as civil society groups disassociating themselves from the official positions of the two governments. The group also worked to break through the political deadlock between the two neighboring countries, but at the same time acting as a track II mechanism to lobby and influence the two powerful governments for improvement in the bilateral relations. 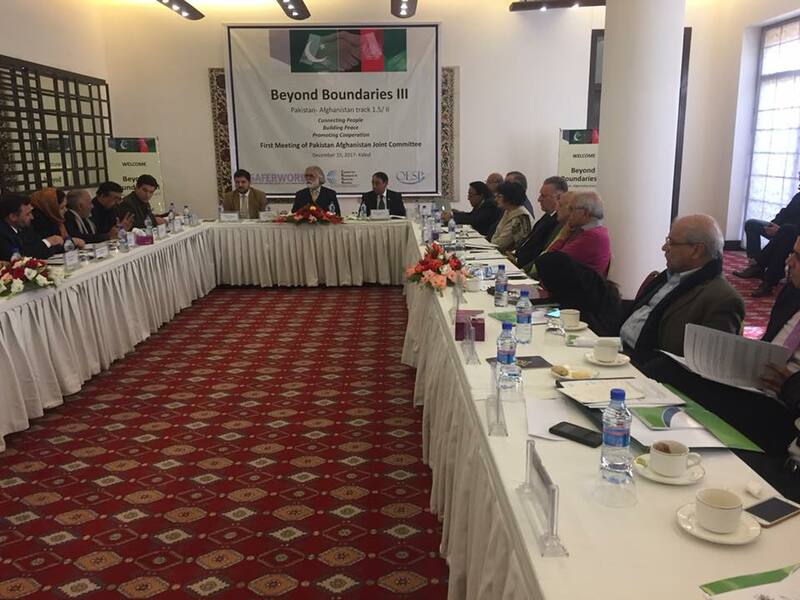 The dialogue commenced with the opening session where the two groups reviewed the policy recommendations of the previous 6 meetings of Beyond Boundaries II; and held a detailed recap and review of political and other significant developments in Pak-Afghan relations- both negatives and positives- between now and last PAJC meeting held end of March, 2017; How to work jointly and build on the positives; and discussion on Peace and Reconciliation Strategy. The first session had interactive discussion on the repercussions of frequent Pak-Afghan Border Closures, re-openings, losses to businesses and traders, and the Way Forward; PAJCCI perspective and Inputs by Ms. Faiza and Mr. Naqibullah Safi; Early revival and rescheduling of JEC, APTCA meetings and APTTA review; and discussion on Bilateral Preferential Trade Agreement (PTA). During the second session they held Interactive discussion on other important bilateral issues: Refugees – Latest on ground realities; Media – Role of Pakistan and Afghanistan Media in Bilateral Relations and addressing misperceptions through dissemination of positives instead of focusing on negatives only. 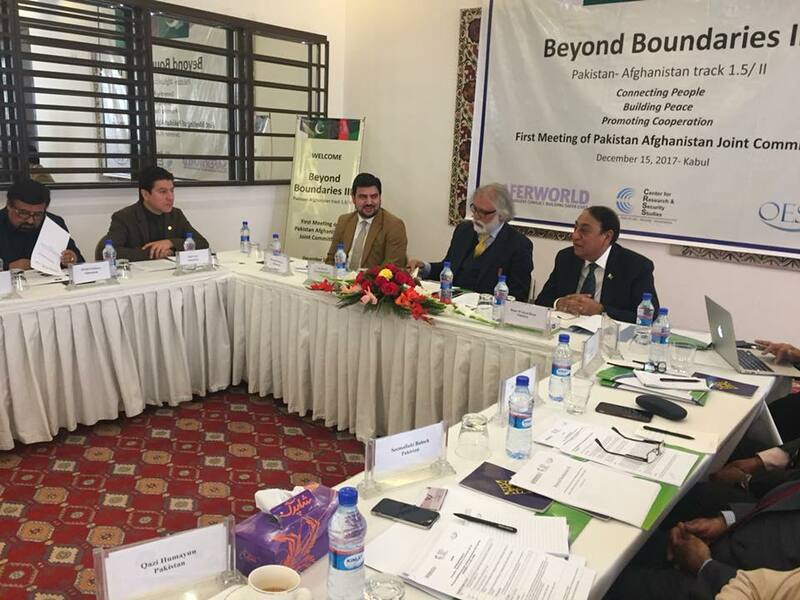 The third session included Way Forward from the deliberations and debate around the focused themes of the workshop; and formulation of policy recommendations (where 2 -4 members each from Pakistan and Afghanistan side drafted the recommendations suggested earlier). In the Last session, the Chair read out the policy recommendations and after deliberations both the PAJC groups approved and adopted the policy recommendations as Joint Declaration from the first meeting. he Joint Declaration welcomed the recent proposals shared between Pakistan and Afghanistan, especially the start of the process of various working groups to address issues affecting their bilateral relations. The PAJC strongly called upon on both the governments to convene meeting of the Afghan-Pakistan Transit Trade Coordinating Authority (APTTCA) as soon as possible to address pending transit trade issues. The recommendations called for immediate resumption of the bilateral trade talks, including recently imposed regulatory taxes on Afghan exports to Pakistan. The PAJC urged Pakistan to expedite and facilitate implementation of the scholarship programmes for Afghan students. The recommendations requested the Afghan government to facilitate completion of Pakistan-funded projects in Afghanistan and provide all necessary support, including timely tax waivers by the Afghan government for equipment being imported for these projects. The recommendations pushed both the governments to revisit the visa regime and facilitate and improve visa-related issues from application submission to the issuance of the visa itself. Both countries should also introduce special visa regime for businessmen, parliamentarians, media representatives, patients and attendants, the participants stressed. In order to improve bilateral relations, it was recommended that youth exchange programmes be organised. Journalists’ short exchange programmes must also be organised for better understanding of each other’s perspective, the declaration said. Cultural programmes may also be organised to facilitate participation of prominent singers. It was announced in the meeting that the Forum for International Relations Development, a UK-based conflict resolution think tank, will offer scholarships for tuition fees only to five Pakistani and five Afghan students for undergraduate and post graduate British qualifications through School of Economics and Law (SOEL), UK. The CRSS and OESP will recommend and lead the process, while the final selection will be done by SOEL, UK. The applicants in both countries must meet the UK visa and immigration requirements. As part of strategic sideline meetings with the Government of Afghanistan, on Saturday 16 December morning, The Pakistan PAJC held a meeting with Mr. Abdul Rauf Ibrahimi, the Speaker of Wolesi Jirga – the lower house of Afghan parliament. The Pakistani delegation stressed the need for strengthened ties between Kabul and Islamabad. The Afghan PAJC members were also present during the meeting. Rana Afzal Khan, the head of Pakistan delegation handed over the Joint Declaration of Policy Recommendations to the Speaker.After the meeting the PAJC members visited live proceedings of the Wolesi Jirga session. Later that day, the Pak and Afghan PAJC members held a meeting the Chief Executive Officer (CEO) of Afghanistan, Dr. Abdullah Abdullah, at his office at 12:30 pm. Dr. Abdullah told the participants that true fight against terrorism can pave the way for trust building between the two countries. He said Afghanistan always underscored the need for improved relations among the neighboring countries, which should be based on mutual respect, good neighborhood and sincere cooperation. The PAJC heads of delegations handed over and shared the Joint Declaration of Policy recommendations to the CEO. After the meeting the CEO hosted a working lunch for the two PAJC delegates. Same day selected members from Pakistan and Afghan PAJC groups visited Karwan University and Kardan University, for interaction with youth and academia through lectures/ presentations by members from both the delegations; these university visits are part of the outreach to the youth of Afghanistan designed for the initiative to counter misperceptions about each other and improve their understanding on the Pak-Afghan bilateral relations. As part of the strategic communication through media dissemination, 2 or 3 members of Pakistan and Afghan PAJC participated at TV primetime talk shows at Tolo TV, and Shamshad TV. Besides Afghan TV shows, GEO News and DW covered the dialogue and visit proceedings.